Marcopolo’s Audace coach represents a bold move into Australia by one of the world’s biggest coach builders, writes Steve Skinner. 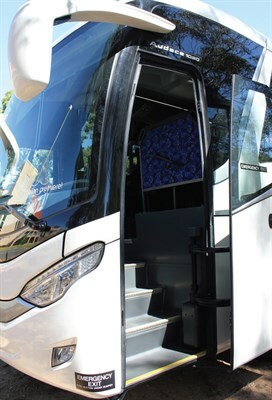 Bus industry veteran Jason Eldred swung so confidently through western Sydney streets and onto the M7 Motorway you could be forgiven for thinking he’d been driving the sparkling new Marcopolo Audace coach all morning. In fact Eldred had never driven the Audace before. The skill came from being in the bus game since he was a kid. The reason he hadn’t driven it before was that the new coach had only been launched a couple of days previously, at the Australian Bus + Coach Show 2013 in Sydney. The bus is so new that even Eldred, the Market Development Manager for Marcopolo Australia, hadn’t had a spin. This particular Audace — pronounced ‘Ordarsi’ by the manufacturer and stemming from the Italian word for ‘audacious’ — is the only one in Australia so far, but by February 2014 there will be at least a couple of dozen in the country. If sales go well there will be many more of course, and not necessarily just on the current Volvo chassis. 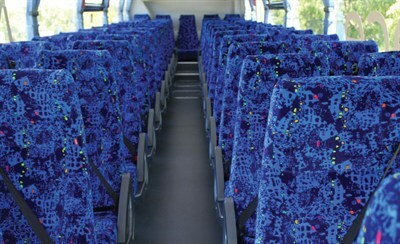 Marcopolo estimates annual sales of this type of imported school-charter bus runs to about 350 units a year in Australia. 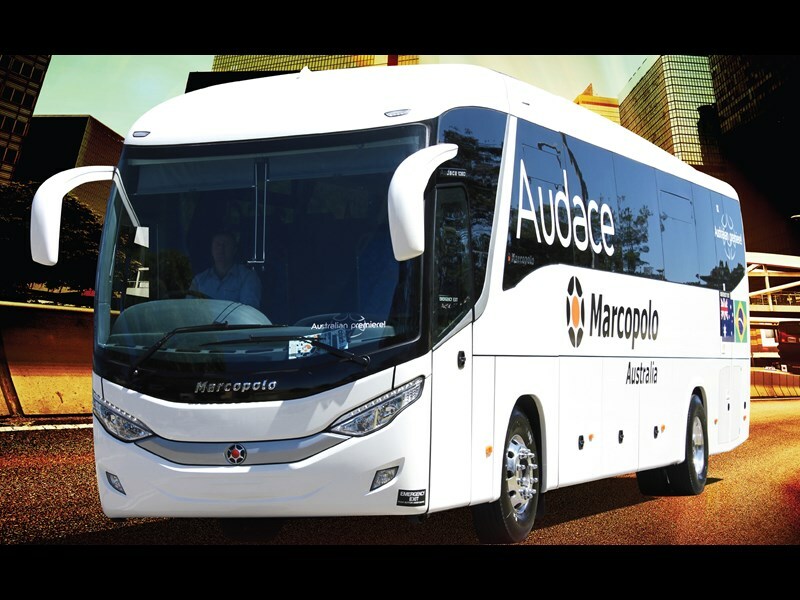 The Audace is a completely built-up (CBU) coach designed and engineered in Brazil, the home of Marcopolo, which is one of the world’s biggest coach builders. The model destined for Australia is currently being built in China, mostly using components in common with the dozen or so other Marcopolo manufacturing plants around the world. Marcopolo says it’s the same bus as is being built elsewhere, except it is 2.5m wide and right-hand drive, as are other Audaces being built in the Chinese plant for Hong Kong and South Africa. This bus is specced to suit Australian school-charter needs. At present there is little choice in specs, but the upside of that is a very competitive price of around $290,000. For that you get 57 non-reclining seats but with seatbelts, an Isri driver’s seat, a Volvo B7R chassis putting out 290hp (213kW), a 6-speed ZF EcoLife automatic transmission and a triple-treated galvanised steel body. If you want an aluminium frame and more options you’ll have to go for the Volgren Endura, manufactured by Volgren, which is Marcopolo’s subsidiary in Australia and comes in at between $330,000 and $350,000. The Audace is Marcopolo’s effort at competing with imported school-charter coaches at a price point Volgren’s offerings can’t match. The view from the big tinted windows at the rear of the coach was good, the fabric seats were comfortable — but without head inserts — the vinyl floor was clearly suitable for messy school kids and footy teams, there are interior luggage racks, and the engine noise level was fine. At the front of the coach there was an annoying noise which at first seemed like radio static. Turns out it was wind noise through the inadequately sealed front right corner of the bus near the driver, which Eldred says would be addressed before the coaches go on sale. Eldred turned off the motorway and we drove into the Campbelltown campus of the University of Western Sydney for a few photos with a bit of space to park. It’s the sort of day-charter environment that one could well imagine the Audace serving. Eldred opened everything up to reveal plenty of luggage space and access for the driver to check the oil and coolant. Gazing at the roof line, the Aerosphere 355 air-conditioning unit isn’t noticeable, which means it’s good for aerodynamics. Meanwhile the frame underneath the attractive-looking Audace is tubular galvanised steel, triple rust-treated with an electrostatic dipping process, body deadener and foam injected inside the tubing. Eldred says similar Marcopolo coaches in Brazil have had no problems lasting the test of time for at least a couple of decades. The side panels on the Audace are aluminium with fibreglass fronts, rears and roof. The entire bus is about 300kg heavier than its Australian-built stablemate Volgren Endura. Most of the lights — but not the headlights — are LED. There are also daytime running lights, fog lights, heated anti-fog mirrors, parking sensor, reversing camera, four-camera CCTV and a multimedia system. Before long it was time to get behind the wheel. While getting organised the first thing you experience is the comfortable Isri seat with plenty of adjustment options. With the steering wheel suitably adjusted it was easy to reach everything on the simple but stylish dash, and interesting to see the same easy-to-read electronic screen display as shared with Volvo trucks. On checking the stylish electric aerodynamic bug mirrors however, a big problem was evident. There is no spotter mirror for those small cars that sneak up beside you, and the driver can’t check over his right shoulder because there is a panel in the way. There is a small spotter mirror under the main mirror, but it covers the front of the bus, which is hardly necessary because vision through the front is great. Eldred says a side spotter mirror is an option that can easily be added. Meanwhile the sun glare blinds are manually operated. Eldred says this is because a driver will inevitably try and pull down an electric blind and quite possibly break it, leaving no blind at all. It couldn’t be easier to select ‘Drive’, with a slim line of gearbox options in easy reach to the left on the dash. Once under way the ZF EcoLife moved smoothly through the gears. However, when putting the foot to the floor merging back onto the nearby freeway, nothing much happened. This ZF, designed for city buses, didn’t kick down but the coach hardly sped up either. A bit of tweaking to the computer program might make a bit of a difference but no doubt the main factor behind the sluggishness is the 7-litre Volvo D7E engine, which would never propel the Audace to win a race against an interstate coach. For example, Greyhound has just bought 30 Volvo chassis with the 13-litre B13R engine. 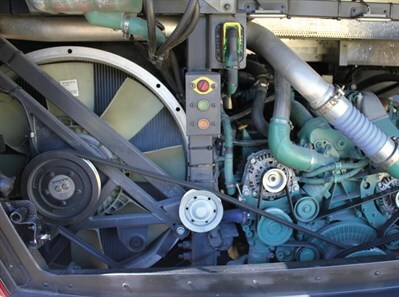 However, the Volvo D7E engine must be good on fuel and reliable or Brisbane City Council and the Public Transport Authority of Western Australia, among others, wouldn’t have recently bought many hundreds of them between them. Once up to 100km/h on the freeway the Audace sat on 1,700rpm and didn’t feel like it was working hard. In fact it was a pleasure to drive, and handled several roundabouts very well on the way back to HQ. ‘HQ’ was Volgren’s western Sydney workshop at Prestons, and it’s here that one of the Audace’s major selling points becomes clear. 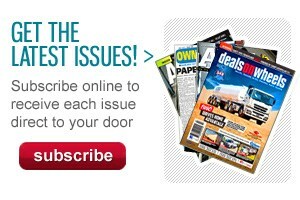 Its body will have back-up from the Volgren network, with Volgren being the largest bus builder in Australia. 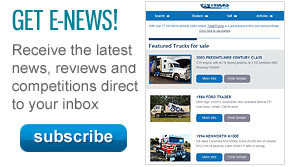 The chassis will have service and support from the 70-strong Volvo national dealer network. Both Marcopolo and Eldred have plenty of experience to back their product. Marcopolo has built more than 360,000 buses since it began operations in Brazil more than 60 years ago. Today it operates in more than 110 countries and manufactures in about a dozen — Brazil, Australia (Volgren), Argentina, Mexico, Colombia, China, India, Egypt, South Africa, the United States and Canada. Meanwhile, Eldred knows what he’s talking about when it comes to buses. His parents Ross and Joan Eldred ran a well-known tours company in country Victoria named after them for nearly four decades. Jason Eldred worked for Eldred’s for 20 years and in the last three owned and operated his own tour coach as well. For the last several years he’s worked in sales for Volgren. To top off the intergenerational expertise, his two sons work as diesel mechanics on buses. Eldred sums up what he sees as the main appeal of the Marcopolo Audace. "Number one, it’s supported by Volvo," he says. "Number two, it’s supported by the Volgren network. Number three, it’s very well priced, and number four, you can buy this product with confidence that the bus will last — because in 110 countries these buses operate on the harshest road conditions and they’re proven to survive more than 20 years."